It's bad enough to be orphaned at a young age. It's worse to be shuttled from distant relative to distant relative, always a burden that no one wants to deal with. But to see yokai wherever you turn and to be thought of as crazy because of it? That's just plain unfair. That's the life that Natsume Takashi has been given in Natsume's Book of Friends Volume 1. Poor Natsume's a pretty good kid, considering everything that he's going through. True, he's a little tired and spaced-out at school, but you would be too if your second job was to deal with the apparent infestation of yokai that Japan is plagued with. In the first chapter, a lot of Natsume's life starts to make more sense. His grandmother Reiko, who he bears a striking resemblance to, and who was also a loner, saw yokai as well. Because she was always alone, she started interacting with the yokai more. Eventually, she started tricking them into writing their names in her book, and as long as she had their names, she had power over them. The years went by, Reiko passed away as humans tend to do, and her book was packed away and forgotten. But the yokai she deceived longed for their lost names. And when a new person comes to town who looks so much like Reiko, the yokai make their presence known like never before. One yokai in particular, named Madara but called by Natsume 'Nyanko-sensei,' has taken a particular interest in Natsume. Originally intending to steal the book - and thepower to control the other yokai - from Natsume, he eventually falls into a sort of teacher-protector-pet role. He helps Natsume learn more about his abilities, and how to release the yokai from the binding. Because the series started as one-shots, each story is much more self-contained than other manga. Along with releasing spirits that have been bound by his grandmother, we see other spirits in the area, many of which are simply going about their business. Some of the stories are truly touching, especially when Natsume takes care of the spirits that just gather in a town. The episodic nature, and higher page counts than typical manga chapters, makes them very nice to read one story at a time. The artwork is fitting of a shojo book, but still better than most. While many of the yokai are wispy and undefined, it simply adds to their ethereal quality. Character designs are well done, and characters are easy to distinguish from one another, which is sometimes all you can hope for. And it's nice to see a kid like Natsume every once in awhile, who tries his best to fix his little part of the world, when he's done nothing to deserve the job. Natsume's Book of Friends is quickly becoming a title that I'll be anticipating on its drop dates. 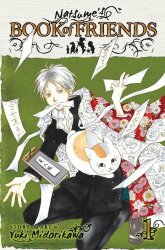 Lows: Because this title was not a regular title in its manga, the reintroduction to Natsume each chapter gets frustrating. Verdict: A shojo series with blessedly little romance makes this a great read.